Series devoted to saving treasured heirlooms from the scrapheap. Eric Knowles and his select band of expert restorers save more treasures in Stonyhurst College, Lancashire. Hello, I'm Eric Knowles, asking you to dig out your dusty treasures. Can they be restored? Should they be restored? with a roll call of famous former pupils like Sherlock Holmes' author Sir Arthur Conan Doyle. And, talking of classics, we've got a host of timeless pieces today. Everyone wants to know if their possessions are of value. Enough for a chateau in France? -I'd like to hand it to my family. And will they make any money at auction? Who will start me at £2,000? You've worn the thing out! I went into the lounge one morning and there it was, all in pieces. I don't want to be unkind, but your rocking horse is one step away from the knacker's yard. 'It's always a pleasure to be back in my native Lancashire. See what it's like underneath. Scotland, from about 1907, I think. 1907. I think it might have been just a few years more. I think this is very late Victorian. -You do a lot of writing because you've worn it out! So have you got any ideas as to its value? -It's worth a bit more than that. I know it's in a bit of a state, but in this condition I reckon it's worth £300, £400, possibly £500. Certainly worth spending money on. 'A job for furniture restorer Tim Akers. Obviously, leather comes to mind. That's completely shot to pieces, so we'll replace that. The other thing that lets it down is that this is quite a nice warm colour on the top. -On the front here, it's slightly green. It's where the sun has bleached out some of the warmth from it. I can warm that up a little bit. -And this is rather loose here. -I think that's meant to come off. -It is. It's never had any glue. I might tighten the holes up so that it fits more snugly. That way it won't wobble around or fall off. I think I could do that for £250. There's quite a lot of work there. -Well, I think that sounds all right. 'In its current condition, the desk is worth £300-£400. 'which could see it reach £1,000 at auction. 'assuming Tim can bring it up to scratch. 'We've got wounded personal treasures aplenty here today. -He's been a family friend for some time? We believe my father played on it and, prior to that, my grandfather and even my great-grandfather. Were you allowed to play on him or was he in a bit of a state? No, we played on him. Quite a lot. He's called Neddy. -Something you're thinking of selling? -Er, yeah, we would do. We're aware that it's relatively unsafe in this condition. So we would spend some money and potentially put it to auction or sell it. because he's on a safety rocker. so this was a safety improvement. I have to admit that I don't think I've come across one quite as small as this. He's obviously been designed for somebody no more than four or five to play on him. Any suggestion of who made it? We believe it's G&J Lyons. he needs some serious surgery. It begs the question, how much money would you have to spend to bring him back to his former grandeur? It's really a case of trying to make sure he's still roadworthy. 'The man to get this old nag back on track is Malcolm Green. -as to what you consider to be absolutely essential. First of all, it's got woodworm here. That needs to be done. they're relevant to have repaired. -Did you know about the woodworm? and I thought that was where the darts bounced out the board! I don't think this has been anywhere near Eric Bristow. I think you have got a little bit of a problem there. -If you are going to back any horse in your life, it might as well be Neddy. Right? We're all agreed? 'In its lame condition, this tired pony is worth under £200. 'Malcolm will do the essentials for £100. 'It could raise his odds to £300 plus. 'if he's to win the day at auction. -Somebody who will forever remain nameless. 'but one of them is in bits. Looks like a job for our ceramics maestro. 'Roger Hawkins is one of the best in the business. -Do you recognise what it is? -I do. A Crown Derby vase. -How long has this been in your family? -About 31 years. One of a pair. -It looks like it to me. 'Originally based on an Oriental design, this pattern is known as Old Imari. This looks post-war. It's probably 1940s, 1950s period. They would have made these patterns over a span of years, so they would be within that period. Shall we look at the bad news? and, em, there it was, all in pieces. and this type of break is common. and then you have a change in temperature where it just pops. as best I can. There will be some very obvious gaps. What I try and do is put it back together so that some of those cracks are less obvious. will probably be worth now about £500, £600, £700. but there's only one of them. Like this, it's worth nothing. After you've paid me £150 to put it back together... it will be worth nothing. -I'd be able to display them and I'd be quite happy with that. -You're happy for me to restore it? -I think that's a good idea. Like this, it can only go back in the shoe box. But repaired you have a nice pair. 'with the broken one bringing a big, fat zero to the party. 'but they won't be worth much more. 'and, judging by all those pieces, it might be one of Roger's toughest yet. 'Our restorers are an experienced bunch, so there's nothing they like more than the unexpected. -Wow. It's a wonderful music box. Have you tried it before? It's always made a ghastly sound. We can see if we can get some noise out of it. I think it would sound absolutely wonderful if it was working properly. All sounds a bit clunky now. Oh, dear. That's possibly because there's a problem with the butterfly, this thing going round. -Quite simply, somebody has taped it up. -Yes, not me! It was always like that. The market for these is really strong. It really is. It has everything going for it. The bells, the bees, the hammers, the drum. Absolutely everything. As it stands, it's probably worth around £3,000, which is a lot. -To fix the butterfly here would cost in the region of £300. It could make up to maybe £4,000, £4,500. That sort of figure. -You're making an extra £1,500. 'This wonderful Victorian music box is worth £3,000 as it is. 'which could see it hit the high notes at auction. 'Another sound investment, but it's going to take some expert tinkering to get it back in tune. 'With the rocking horse too, it's a race against time for Malcolm. 'Over at his workstation, Tim's hard at work on the Davenport desk. -The leather was completely perished. It's a lot thinner than leather you get now. I mean, that is incredibly thin. and I'm using my left hand as a guide, pushing the blade away from the edge of the veneer. That's a nice clean edge now, which the leather will fit into. 'Sometimes antiques arrive at our roadshow looking, well, pretty beaten up. 'A quick diagnosis often reveals that they need more than our first aid kit. It really needs to get into the joint. You want it to squeeze out of the joint. That's a lot of glue in there now. When you squeeze a joint together, you get glue creeping out and it has to be removed. Better to remove it at this stage. -These things are jolly good. for tying items on the roof of your car, luggage and that sort of thing. -That's brought that joint up to the position it needs to be in. -There's remnants of some PVA there. It hasn't gone far in. -It needs to be removed. 'so he uses a steam gun to soften it before applying his own glue. We're doing these minor breaks to make that person looking at it think it doesn't need too much. 'Let's hope the bidders at auction agree, Malcolm. 'brought in by Millicent Barron. I'm sitting here looking at the next piece to glue. It is a jigsaw. -Let's look at this one. -'But gluing the pieces together is only half of the problem. so that it's in alignment there, it's not going to be in alignment there. There's going to be a gap. So I think all I can do on this piece is try and glue half of it. I've got to decide which half. Maybe from there to there. run some glue in it and force that back into position. Easier said than done. I'll never get it perfect. It's almost a lost cause, but we try for as good an alignment as we can. They really are very difficult to do. We'll just do one piece at a time, very slowly but surely. so I have to be very careful how much force I use on that. -There's no substitute for experience. to actually work out where to place the clamp. It's damaged enough as it is. We don't want to cause any more damage. It's got glue and all sorts on it here. is when you have to undo repairs that were undertaken by people in the '20s, '30s and '40s. and they used the materials at hand. Chewing gum, old sticks, all sorts. I think I'll be able to use these. I thought I might have to replace them, but they'll clean up OK. They're not too badly bent, so I'm just straightening these out. Hopefully, we'll re-use them. Looks like a baby elephant. When the screw is in fully, there's no resistance to the butterfly. They're flopping down like so. Normally, they should be held at a resistance like that. Obviously up to get least resistance, down to get more. That governs the speed of the motion work here. We've got to put a washer or a bush in there to stop that happening. 'which is why our restorers are in demand. 'They really have worked wonders today, breathing new life into your tired and broken treasures. 'And it's crunch time now as we reveal their handiwork. 'Katie Hindle brought in a well-travelled Davenport desk, passed down the generations. Oh, my goodness! What a difference! It's like new. 'its veneer chipped and faded, its writing leather in tatters. 'Now the chips are gone, the wood's been warmed up, there's new leather and it's positively gleaming. -Any idea of value now? Well, I wouldn't be at all surprised to see one at anywhere between £900 and £1,000 in an antiques shop. -So the money was extremely well spent, wasn't it? 'and won't be selling. Neither will Millicent, who is looking forward to seeing her Crown Derby vases. -It was in a state, wasn't it? 'Putting it back together again has been a real labour of love. 'Time to find out if all Roger's hard work has been worthwhile.' Here we go. Nice and gentle, Eric. Oh! Oh, I can't believe...! It's lovely. He's done very, very well. It was a mess. 'Before, this Royal Crown Derby vase was friendless, it's partner had gone to pieces. but at least you've got... From where I'm looking, they look as good as new. -Both of them, don't they? -Nobody will know from a distance. -I won't tell. Will you? 'A gift from her late husband, Millicent's hugely attached to these vases. I've got to give you Brownie points. A lot of people would have been tempted to put it in the dustbin. -It was just looking pretty desperate. I couldn't throw it away. It held so many memories. -I think that morning when I found it, there were a few tears. Yes, because it reminded us of a lovely day when we bought them and we were together. -Do you think he'd approve? -Yes, I think he would be very thrilled. 'And I can't tell you how pleased I am to see these vases together again. 'our restorers have been kept busy. 'and Millicent's Royal Crown Derby vases, to take pride of place. 'And there's that charming Victorian music box. It's struck a new chord with Wendy, who decided to keep it. -Come on, let's have three. 'It's auction day here at Salter's Auction House and there are plenty of eager bidders eyeing up the lots. 'We're hoping they fall head over heels for Neddy, the rocking horse. -So how are we feeling? -Excited, as well, but nervous. Shall we see the current state of Neddy? -A lot more secure. Sturdier. 'Before, poor old Neddy was in no fit state for auction, riddled with woodworm and his feet taped up. The work that he's done has been structural. There was no way on Earth you could have put this into an auction in the state that it was. on giving him back his former splendour. Do you think he has a better chance than he had before of making it to the finishing post? -I think he'll get a bit further. No, well, time will tell! 'When we first saw this charming Edwardian rocking horse, it was worth less than £200. 'which could see them run away with £300. 'Fingers crossed for horse lovers. 'Remember, if you buy or sell at auction, you will have commission and other charges to pay. We're on. He's under starter's orders. A G&J Lyons painted rocking horse. A nice little example there. Quite unusual. Lot 1181. 100 I'm bid. At 100. 110. 260. 280. I have a commission bid at £280. 280. We're at the top end. Come on, let's have three. -Still on commission. I'm selling. -320! What do we think? A bit more than we expected. It covered the restoration expenses. We definitely backed a winner. It just goes to prove that our restorers' skills are worth every penny. They were certainly on the money! So join us again on Restoration Roadshow. 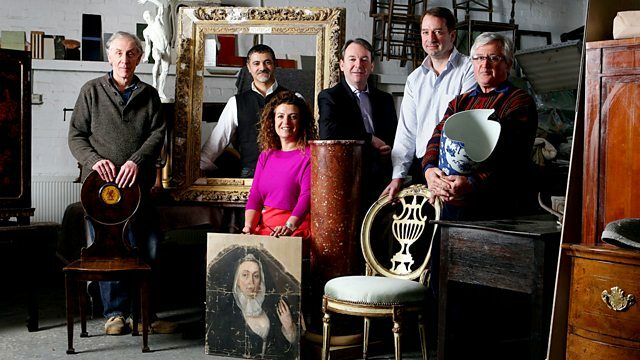 In their never-ending campaign to save antique pots, paintings, vases and more from the scrapheap, Eric Knowles and his select band of expert restorers head for Stonyhurst College in Lancashire. As members of the public start arriving with all sorts of items, Eric and his team swing into action. While wood wizard Malcolm Green tends to a tired old rocking horse that's looking very lame, furniture restorer Tim Akers faces the delicate challenge of saving an elegant Davenport desk. And if that's a tough one, imagine what ceramics guru Roger Hawkins feels when he comes up against his worst nightmare - an exploding Crown Derby vase. As the team members struggle to revive their patients, the big questions remain to be answered. Will the owners like what they see? And if the items go to auction, will they attract the bidders and make any money?